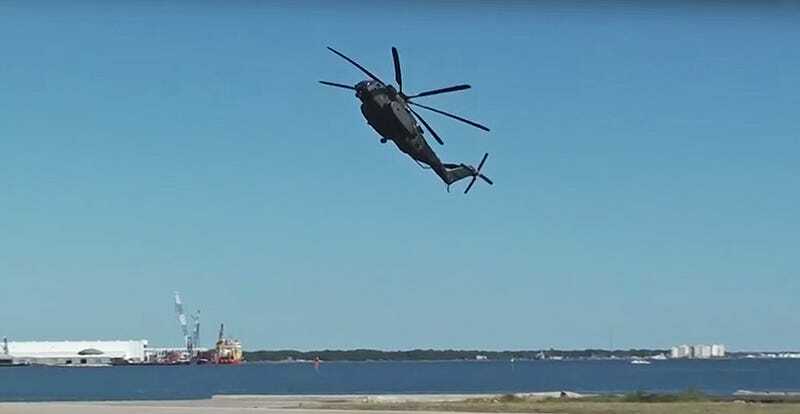 The Navy’s MH-53E Sea Dragon, along with their Marine CH-53E Super Stallion cousins, are the largest and most powerful helicopters in the Pentagon’s inventory. This is why seeing one of these beasts hit the brakes and execute a maximum deceleration maneuver, often referred to as a “quick stop,” is so awesome. Although the MH-53E and the CH-53E are very similar, the MH-53E’s huge sponson fuel tanks and dark paint gives it an especially sinister and imposing appearance. These triple-engine helicopters are mainly used for minesweeping but they can also be used in the general utility role if need be. The Sea Dragon community has experienced a series of very unfortunate crashes, with the community now being reconfigured to hopefully avoid these incidents in the future. Because of the relatively small size of their fleet - around three dozen helicopters - it seems like MH-53E units have been neglected in comparison to larger aircraft communities. Now this is changing, and it should as mine clearing is absolutely essential to the Navy’s mission and the versatility of these huge helicopters is very useful, especially during disaster relief operations.